Bruce Banner (Eric Banner) is a scientist working in a lab with his girlfriend Betty (Jennifer Connelly) when an accident happens. His father, played by Nick Nolte, (who Bruce has believed died when he was young) turns up to try to warn him that things are not as they seem. Eventually, it turns out, no spoiler alert here, that Banner has some strange DNA stuff going on that causes him to turn into the Incredible Hulk when he gets mad. It’s an origin story, and for me, it takes a bit long to get anywhere. There are lots of sad thinking shots and confusion. The split shots were a nice nod to the comic book origin of the character and the story. 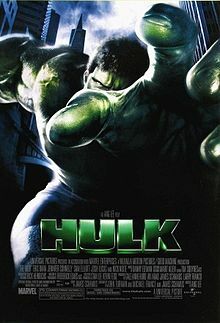 Looking back at The Incredible Hulk, it did a great job of knocking off the whole origin story in the title sequence. It looks like our next Hulk sighting is going to be in the next Avengers film, and it will be Mark Ruffalo again. I’m pleased about this.